Once upon a time, painting a fence was your only choice for giving it a new look. This summer, you have a choice to make. That choice involves your once-beautiful fence. Should you repaint, or is refinishing it the better option? Join us as we find out together. Once upon a time, painting a fence was your only choice for giving it a new look. That was before the option to stain came along. Technology always moves on, and so should you. Every year, you need to look at the paint on your fence. A new coat should spruce it up, but then you’ll have to do it again next year. Don’t forget that before you can repaint, you need to get rid of the old paint first. Old paint doesn’t mix well with a fresh layer. 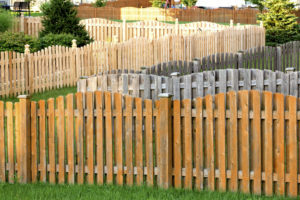 It takes a lot of time and effort, but if you are willing to see it through, then you deserve a fantastic-looking fence. When you restain your fence, you won’t have to go over it again with another new layer next year. Throughout the rest of the first year, you won’t need to worry – this peace of mind is the exchange for paying a higher starting cost to get things going, after all. However, once the stain starts to wear off, you need to clean the fence before you can restain it. Luckily, all you need is your power washer. A solid color stain will make your fence all one color, but you can also use a transparent stain that will seal in water protection – good news for the next time a huge thunderstorm rolls through your neighborhood. The choice is yours. You could also decide to not stain or paint at all, but leave it completely natural, just made of wood. Maybe you could choose white cedar, which will become a gorgeous silvery-grey once it weathers a little bit. This entry was posted on Friday, June 1st, 2018 at 4:19 pm. Both comments and pings are currently closed.